Christmas is one month away and while the grown ups are busy shopping, decorating and being busy, kids just want to have fun. 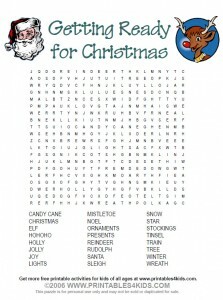 Get the kids in the mood too with this fun Christmas Word Search that is 100% Rudolph approved. Click image to view and print full size or download Getting Ready for Christmas Word Search as a PDF file. Another great activity for my kids and for me to post about! This site has a lot to offer. Thank you very much.